Western North Carolina is known for its long and winding roads. And while the scenic journeys add to the charm of our region, they can be a hindrance for those who need to travel for medical care. 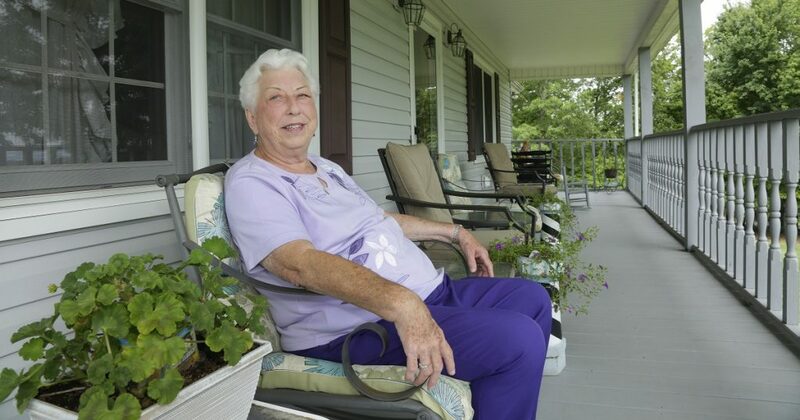 Anne Buchanan of Morganton knows this firsthand. The 77 year old frequently traveled to Mission Hospital in Asheville for medical appointments and hospital admissions due to her congestive heart failure. Now, thanks to pioneering technology offered through Mission’s Heart Failure Program, Buchanan is making that drive a lot less frequently. The system that has helped reduce Buchanan’s need for in-person medical care is known as CardioMEMSTM, a technology introduced by Abbott Laboratories. It allows doctors and nurses at Mission’s Heart Failure Program to monitor patients remotely through a wireless connection to an implanted device. CardioMEMS is the only FDAapproved heart-failure monitoring system clinically proven to reduce hospital admissions. The sensor works in coordination with a specially designed pillow that activates a wireless signal that sends the patient’s pressure readings to a secure website monitored by Dr. Trichon and his staff. Buchanan was the first Mission Health patient to start using the system, and she has been very happy with it. If Buchanan’s readings indicate an issue, heart failure nurses will call and consult with her by phone. They will typically recommend that she make certain adjustments to her medications. If the readings are really abnormal, they will suggest she come to Asheville to get checked. Buchanan said that even though she occasionally still has to travel to Asheville, it’s much less frequent than before. And most importantly, the visits are usually checkups. In the past they were, more often than not, hospital admissions. In the past, Buchanan dealt with a lot of fluid buildup in her lungs and also had to have numerous cardiac ablations. An ablation is an energy-based procedure that helps patients with atrial fibrillation (AFib) get their hearts back in rhythm. Buchanan said that she would often leave the hospital after an ablation, and her heart would be out of rhythm again before she got down the mountain. It was because she had so many of these difficulties that the Heart Failure Program doctors thought she was the ideal candidate for the CardioMEMS. The reason the CardioMEMS is so good at reducing hospital admissions is that it helps identify problems in patients before they get to the point where they need hospitalization. “By having that pressure data, we can act more proactively upstream before the development of those symptoms, and we can adjust the patient’s medications to reduce the likelihood of hospital admission,” said Dr. Trichon. Thanks to the CardioMEM, Buchanan, who was once in the hospital almost every other month, has been able to avoid an admission since November. Her checkups have reduced, too, which has cut back on her hour-long (each way) drive to Mission. recently able to go off her oxygen therapy during daytime hours because her readings have improved so much. Benjamin Trichon, MD, is the medical director of the Heart Failure Program at Mission Health. For more than 40 years, Mission Heart has been a regional leader in cardiothoracic surgery and heart care. Committed to high quality and superior outcomes, our award-winning team maintains years of specialized clinical experience and is dedicated to caring for patients with skill and compassion. For more information about Mission Heart, call 828-274-6000 or visit missionhealth.org/heart .